To begin with an admission up front: ROD SERLING'S TRIPLE W (1963) is not a vampire anthology. 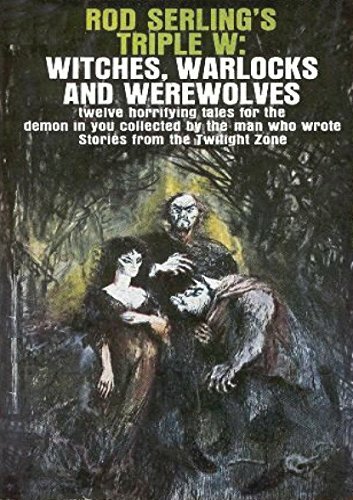 As indicated by the subtitle, it collects tales of "Witches, Warlocks, and Werewolves." Because this is an outstanding vintage horror anthology, however, I couldn't resist telling you about it. 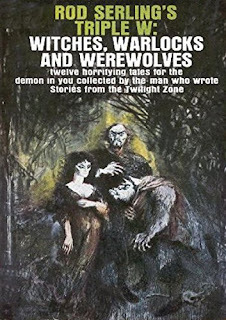 This was one of the first paperbacks I bought in my teens, while discovering horror and fantasy, and it introduced me to several classic stories. Copies are available on Amazon. The two best-known classics in the anthology are Hawthorne's "Young Goodman Brown" (witches, warlocks, and Satan) and Kipling's "The Mark of the Beast" (lycanthropy). "The Story of Sidi Nonman" retells a Middle Eastern legend of a man finding himself married to a witch who sneaks out by night to feast with ghouls. Some of the more recent works: "Hatchery of Dreams," by the great Fritz Leiber, narrates the adventure of proper Bostonian Giles Wardwell when he has to rescue his wife, whom he has just discovered to be a witch, from a modern witch-hunter. In "The Amulet," by Gordon R. Dickson, a sleazy and sometimes violent drifter wanders into the Ozark back country and falls afoul of a pair of witches. The rich but discontented protagonist of "Blind Alley," by Malcolm Jameson, which was filmed under a different title as a TWILIGHT ZONE episode, makes a demonic bargain for a time-travel journey to his youthful home in the early twentieth century, where he plans to enjoy the challenge of building a fortune all over again; of course, the fulfillment of his wish doesn't turn out the way he expects. One of my favorites, a unique and often-reprinted variation on the werewolf, Bruce Elliott's "Wolves Don't Cry," is told from the viewpoint of a zoo wolf who wakes up one morning as a man; he has to learn to be human, a process he doesn't enjoy at all. The book does, however, contain one vampire story, although not marked as such. "And Not Quite Human," by Joe L. Hensley, is probably meant to fall into the "warlock" category. In the distant future, a race of human-like aliens attacks Earth and clears the planet of its inhabitants to prepare it for colonization. Surprisingly, forty-four Terrans survive the attack, and as the story begins, they are prisoners on the alien ship. They lurk in the shadows of their cells and refuse to eat. Members of the ship's crew suffer nightmares and hallucinations, succumbing to irrational fears supposedly long since eliminated from their species, while the prisoners inexplicably grow stronger. At the end, an old man with sharp canine teeth congratulates the captain on the success of the attack: "Nothing human could have lived through it—nothing human did. Some of us were deep underground, where they'd buried us long ago—the stakes through our hearts—they knew how to deal with us. But your fire burned the stakes away." Deliciously creepy! This treasury of haunting tales ends with an essay on "Witch Trials and the Law," by Charles Mackay.